If your cat doesn’t mind you trimming their nails it’s always good to invest in a good set of nail clippers and give regular trims, about every 6/8 weeks. 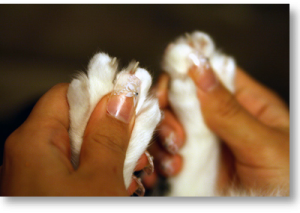 To take a good look at the nails press the pads of each paw gently and the nails will extend. You will see that the nail emerges from a sheath and, if the claw is white, you’ll see a pink core inside that ends before the tip of the nail. This is a bundle of arteries called the “quick”, and it’s what you want to avoid at all costs because it hurts the cat and results in bleeding. Best way to trim the nails is to hook the bend of the claw under the blade of your clippers and cut. This ensures you are no-where near the quick and cutting the sharpest bit of the claw, which is where it bends slightly at the top. Please make sure you check visually too as well as feeling the hook! Have styptic powder handy, or a pet product to curtail bleeding, just in case you do cut the quick. You can check you’re your vet as to the best product. Apply it to the bleeding nail. Don’t forget the small dewclaw too! Note: For nail clippers, like in the photo above, the sliver clip on the bolt should be at the back. That is the way your clippers should be facing.